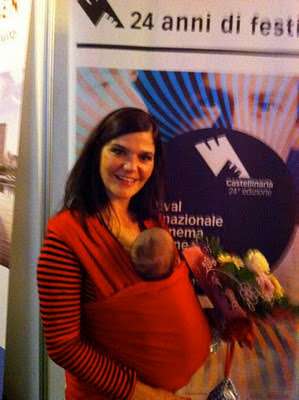 I was nervous, excited, apprehensive and anxious about the event, not only because it would be the first time most of my cast and crew would see the film, but also because I had to have Nina with me and I wasn't sure how I would juggle Motherhood with Director-hood. It turned out alright in the end, only because my most fabulous friend Sarah came with me and took charge of the Nina "situation". 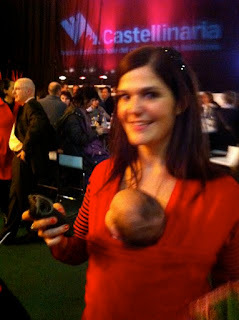 Strapped onto her tummy with the Moby wrap, Nina decided she would not sleep AT ALL and so Sarah was stuck walking up and down the auditorium's corridor all evening and missed the film altogether. I am eternally grateful to her for stepping in and saving the evening!!! Thankfully the film was in Italian that night (she speaks English and German) so she wouldn't have understood anything anyway, so... she got a DVD to take home instead. To watch in English with occasional subtitles, in the comfort of her home, on the comfort of her sofa. Hope you like it Sarah? When the time came, all dressed up "smart/casual" as it wasn't a glamorous affair, we (Claire Price - my leading actress, Emily Man - my producer and Christof Neracher - my other producer) were called on stage to introduce the film. I was buzzing and my stomach was doing some strange flips that I totally forgot how to speak Italian and when the questions were thrown at me I mumbled and stumbled over my words, until I apologized and cracked a joke about my "bad native Italian"... thankfully that broke the tension. Still... as my hormonal head was swimming in nerves, I forgot to thank all my fabulous cast and crew who were in the audience that evening (it was the first time many of them had seen the film), which I am incredibly ashamed about. I have since made amends, but what the heck was I thinking about? It was incredible to finally see JUMP on the big big screen of a cinema auditorium. I lost myself in the story (which I take to be a positive thing, as I have seen the movie a million times), and enjoyed the event. At the end of the screening they called Claire and I back onto the stage, and left us there, to bask in the glory of the applause (very weird sensation... to be standing on stage, just being, and soaking up the atmosphere... Claire and I were looking at each other thinking "what do we do now?"). After the screening, with bouquets of flowers in our hands, we drank and chatted to the audience and the cast and crew. It felt like a whirlwind evening, not much time to really talk to anyone, but none the less wonderful. 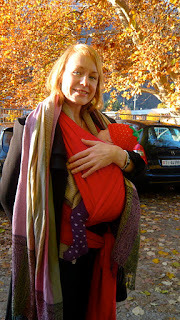 Nina was strapped to me by this point (giving Sarah a well earned rest), and wide awake (she just didn't sleep a wink! How is that possible?) she soaked up all the adulation and cooing which was coming her way. She was a great buffer. If some people perhaps didn't like the movie, then they were smitten with the other little gorgeous creation I had with me. Ahhhh the glamour, the glamour!! !